A Note from PaleoBetty on 10/6/11: Hello, all my lovely readers! I’ve actually gotten a bunch of interest in this recipe lately, and I wanted to give you all a heads-up that I’m reworking it… It was one of my first adaptations, and while it’s delish, it can be even better. 🙂 If you’re looking for a decadent dessert immediately, I’d hop over to the flourless choco cake – it’s super simple to make, and it’s ridiculously rich. At a party this weekend, I just cut it up into little 1″ squares to share. Yum! Indulgent, gluten-free, and dairy free. Oh, yum. CrossFit Central is hosting a bake sale today to support the Habitat for Humanity build, and given that I’m a huge fan of baked goods (professional cake baker in a past life), it seemed like a good idea to try a recipe. For inspiration, I looked to Elana’s Pantry (amazing gluten-free, low-dairy, low-sugar treats) – I’d tried her Almond Joy Bars in the past, and I’d been looking for an excuse to do an adaptation of my own. I think I’ll keep tweaking the recipe – the very bottom bit does still tend to come out a little underdone, but honestly, these things taste ridiculously good. They passed with flying colors with my 12-year-old, and he was VERY nervous about the almond extract going in… I think the key is getting really high quality dark chocolate chips. Next time, I’ll further reduce the quantity of palm sugar – I like my treats a little less sweet. I’ll keep you posted as the recipe evolves! Whisk eggs, coconut milk, almond extract and palm sugar in a large bowl until well-combined. In a medium bowl, combine almond flour, coconut flour, salt and baking soda. Mix dry ingredients into wet with your stand or hand-mixer. Grease an 8×8 inch baking dish. Pour in batter, evenly distributing chocolate chips throughout. 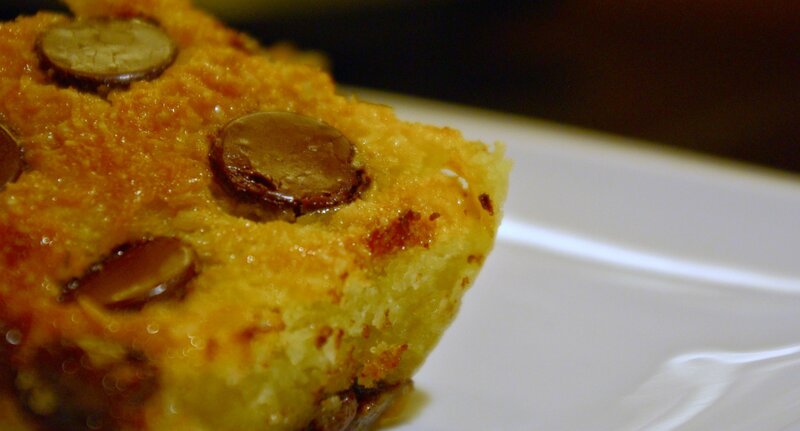 Gently sprinkle shredded coconut and remaining chocolate chips on top. Cool for at least an hour so everything sets. Cut and serve… These are tasty refrigerated as well! I actually found you from my boss, Erik (who apparently used to be YOUR boss at another company). Imagine my surprise when you’re a fellow CC’er (I’m Women’s Only 6:15 MWF). Small world! I’m in JDP’s 7:30pm MWT class! I worked with Erik briefly at Surgient (where we both were prior to our current gigs). I’m so glad you liked the choco almond bars! Hope to see you at a CF event soon! Hey Nicole – here I sit this morning trying to find a good ‘treat’ to bring into our box tonight for one of our coach’s bdays and stumbled across your blog (love it! )- miss you and the Spiceworks crew! I’d actually recommend the macaroons or the dark choco cake (I made the cake this weekend and cut into 1″ bites – perfect for sharing). The dark choco coconut bars need a little work… They’re good, but not up to the standard as the rest of the site. 🙂 Enjoy!